Coastal brown ants Pheidole megacephala, from here. 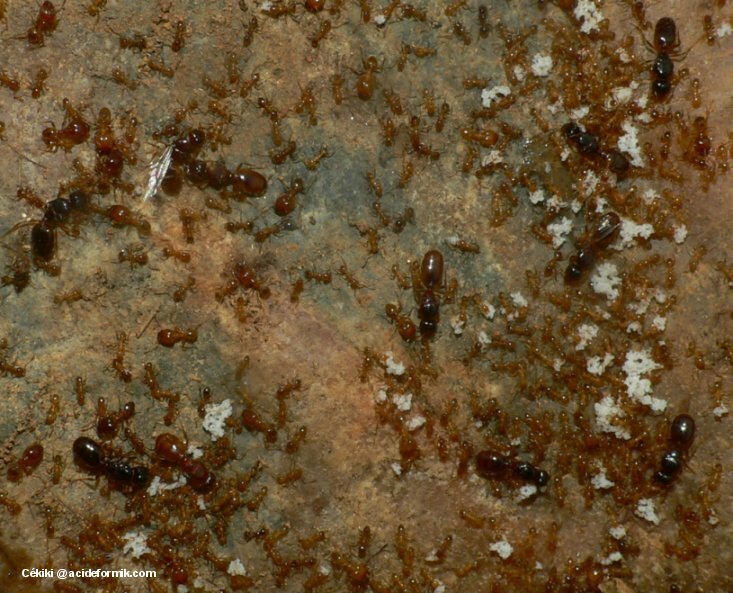 Pheidole, the big-headed ants, is a diverse genus of ants with a clear division in colonies between major and minor workers. The minor workers are usually the more active and most likely to be involved in foraging, with the major workers often specialising in carrying larger or harder food items. 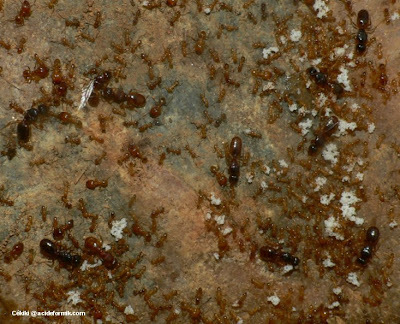 The coastal brown ant Pheidole megacephala has become a significant invasive species in some parts of the world. Characters (from Heterick 2009): Antenna with twelve segments, antennal club three-segmented; promesonotum in lateral view steeply sloping down to propodeum; workers dimorphic. [DL99] Dyer, L. A. & D. K. Letourneau. 1999. Relative strengths of top-down and bottom-up forces in a tropical forest community. Oecologia 119: 265–274. [E89] Emery, C. 1889. Intorno ad alcune formiche della fauna palearctica. Annali del Museo Civico di Storia Naturale di Genova, Serie 2a 7: 439–443. [OT99] Onoyama, K. & M. Terayama. 1999. A new species of the ant genus Pheidole Westwood from Japan (Hymenoptera: Formicidae). Memoirs of the Myrmecological Society of Japan 1: 65–69.